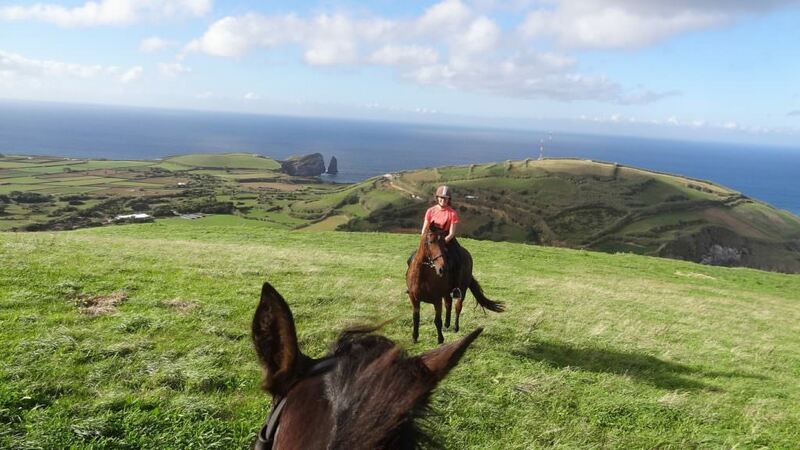 Claire from In The Saddle visited the Azores in October and here is her report of her trip. My arrival in the Azores was timed perfectly with Storm Ophelia. The island had been issued with a red weather warning, the first in 10 years. Despite the wind and lashing rain, we were greeted warmly by Rui, who was born on the island but speaks perfect English. We had a short drive of 15 minutes or so to the Quinta da Terca, home of Christina and Claude de Laval. It was too wet to meet the horses so we were shown our rooms and had time to unpack before dinner. The next morning we had beautiful sunshine! We had an introductory lesson which was a lot of fun! Christina is a great teacher with a positive attitude and sense of humour. In the afternoon we headed out on our first trail ride and ended up with a spectacular view of both sides of the island. The Azores is a really green place, naturally fertile due it being a volcanic island. 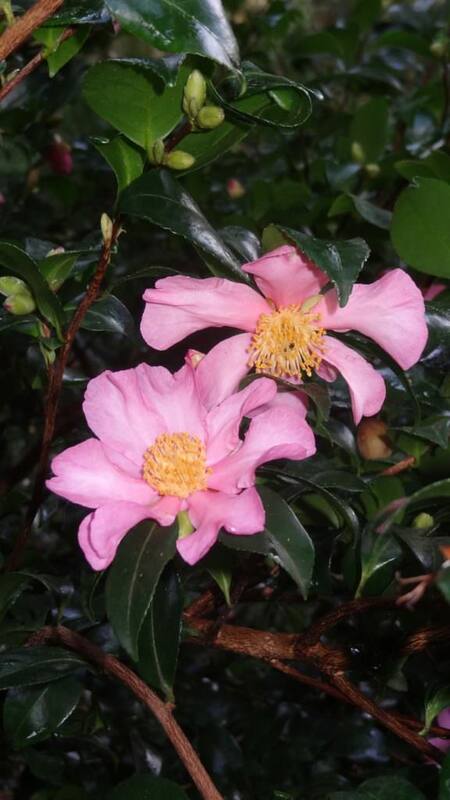 It was amazing to see flowers blooming in October and everywhere a vivid shade of green. So it’s easy to see why we call it the Green Island Trail. This Green Island Trail itinerary has the most riding hours out of the different itineraries available with a combination of full day and half day rides totally around 24 hours riding over 6 days. 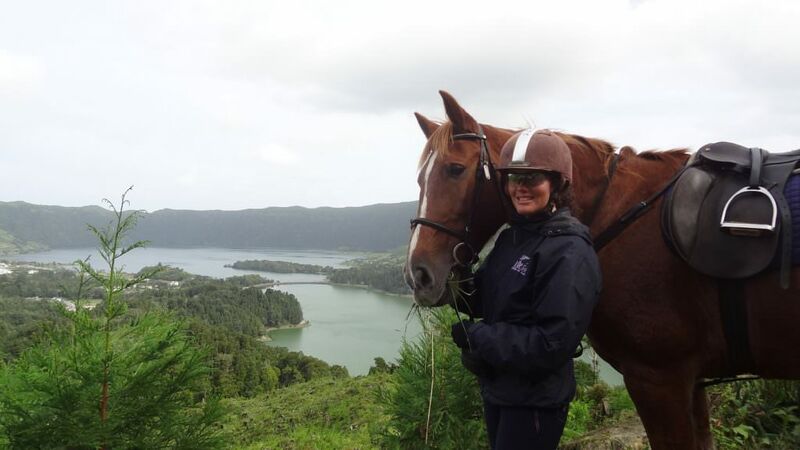 The riding is quite diverse and you see different areas of the island on horseback as well as non riding excursions. We visited a tea plantation, hot springs and thermal baths at Furnas. The thermal baths were perfect for relaxing the muscles after riding. 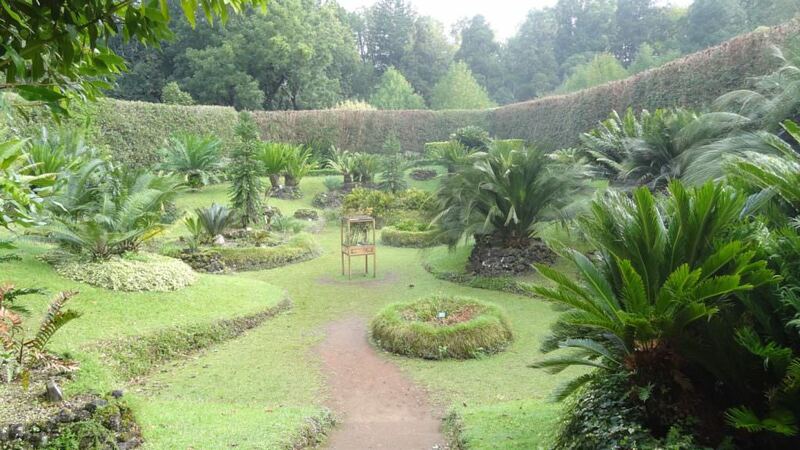 There is also an amazing botanical garden to explore with avenues of ginkgo biloba trees, beds of camelias and the last of the hydrangeas (which the island is also famous for) as well as many more exotic flowers and plants. Food is a very important feature of this holiday. Breakfast is a vast buffet of different exotic fruits from the island. You can try the pineapples that the island is famed for growing. Lunch is often a hot option even when you are on the trail. There is always plenty of salad and bread so it’s impossible to go hungry (poor horses!) Dinner is a three course evening meal by Christina and each one was delicious and filling. 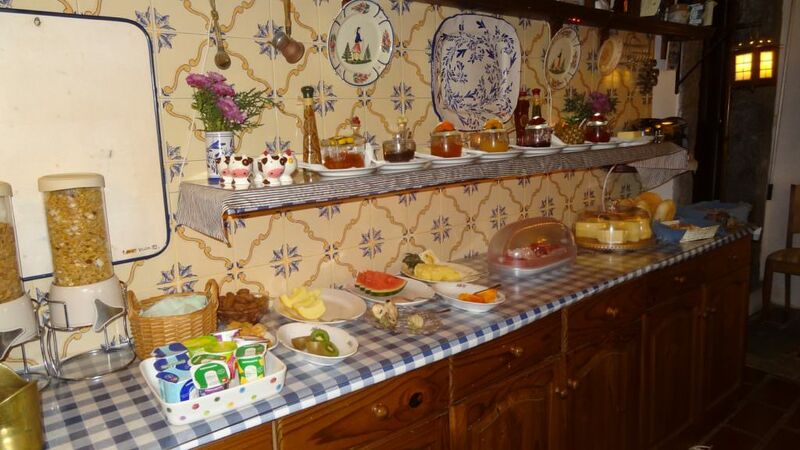 It’s a mixture of traditional Azorean cooking combined with Swedish (where Christina originally is from) which Christina has coined as ‘grandma style cooking’. The thing that makes Quinta de Terca so unique is how relaxing a place it is. I felt at home straight away and I can see how guests return again and again. 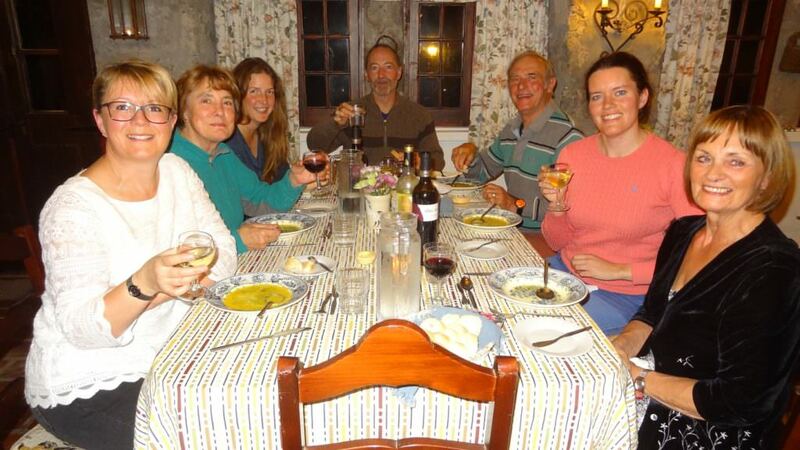 The communal dinner table is great for getting to know more about the other guests. There are around 48 horses at the farm and what is amazing is that most are rescued. They are lovingly cared for and re-schooled to become great trail horses. Many of the horses are ex-farm horses and had worked quite hard in their previous lives. They are now healthy, shiny and a joy to ride. I found it fascinating to look through the book which details a bit about their past lives with some before and after pictures. It was interesting to ride a different horse each day. Over the week I rode Ole (a retired dressage schoolmaster/ex-bullfighter horse Lusitano x Arab); Estrella (normally a guide horse); Ultima (a chunky chestnut mare); Aurora (a bay mare); Imperado (grey Lusitano); and Chico (a bay gelding, who was one of the few horses that came to the farm overweight!). We were given our pick of horses on the last day. It was hard decision between Ultima and Chico but Ultima won in the end. 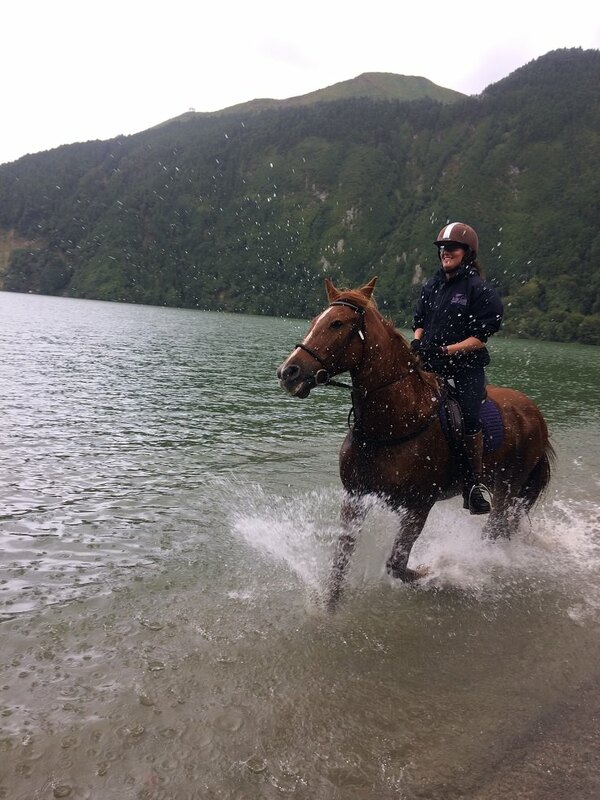 Our last ride was spectacular around the Sete Cidades to see the twin lakes. The story is that a blue eyed princess fell in love with a green eyed shepherd but the king forbade their relationship. Their tears of sorrow formed the two lakes. It does depend on the light but normally one looks distantly green and the other blue. The Atlantis Trail is suitable for intermediate riders who are happy to walk, trot and canter in open countryside or for more experienced riders who prefer to ride for less hours. This is also a combination of half and full day rides with about 17 hours riding in total and one completely non-riding day. The Relaxed Ride is for people who wish for a more flexible itinerary and to explore the island more. It includes 10 hours riding and you stay at the Quinta on a bed and breakfast basis. For this option you really need your own rental car to explore on your own. For complete beginners, or riders who wish to gain confidence there is also a ‘Learn to Ride Week‘. 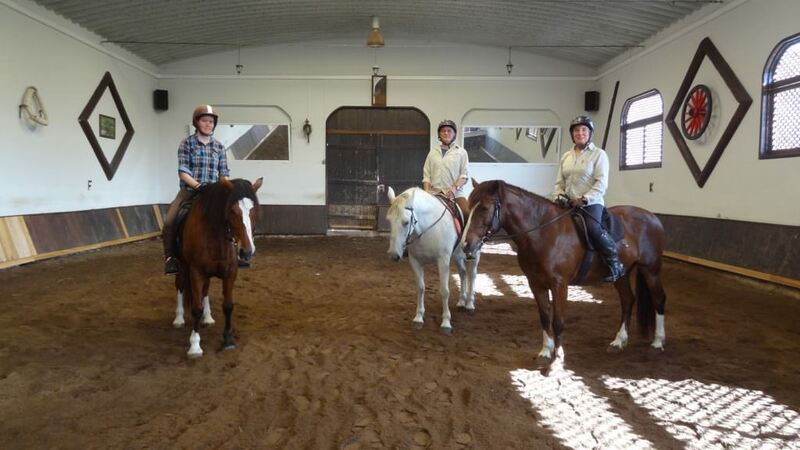 This provides ten hours of riding lessons either in the riding arena or out on trails and also theory lessons. The aim is that by the end of the week you join the spectacular full day ride to Sete Cidades.